Sergio Aguero scored twice as Manchester City came back from a goal down to earn a hard-fought win at Burnley and claim back-to-back Premier League victories for the first time since September. 51-year-old former coach of Cape Verde, Ricardo Da Rocha will take charge of Cape Coast Mysterious Dwarfs for the upcoming Premier League season. 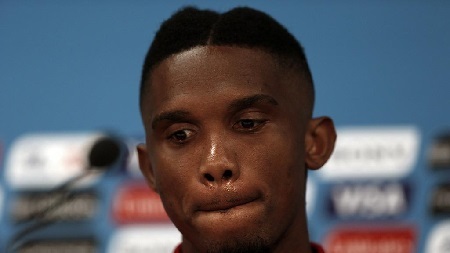 Spanish prosecutors are seeking a prison term of more than 10 years for former Chelsea striker Samuel Eto’o for alleged tax crimes committed when he played for Barcelona. Ghana has dropped four places in the latest FIFA Rankings to place ninth in Africa. Former Liverpool and England captain Steven Gerrard has drawn the curtain on his professional career. Bankroller of Kumasi-based King Faisal Football Club, Alhaji Karim Grunsah has laughed off rumours of his death. The Black Queens of Ghana held the Super Falcons of Nigeria to a one all drawn game at the ongoing African Women Cup of Nations in Cameroon. Schlupp escapes unhurt after smashing his £190k Lamborghini, says "I ain't bothered"
Ghana and Leicester City star Jeffrey Schlupp escaped unhurt after smashing up his £190,000 Lamborghini car and seemed not disturbed by the incident. Black Stars and West Ham player,Andre Ayew was left out in the final Confederation of African Football's five man shortlist for the Globacom 2016 African Footballer of the Year award to be held early next year. Leicester City has qualified to the Round 16 stages of the Uefa Champions League for the first time in the history of the club after beating Club Bruges 2-1 on Tuesday night. Already-qualified Borussia Dortmund crushed Legia Warsaw 8-4 on Tuesday to set a record for the most goals scored in a Champions League match, helped by a Marco Reus hat-trick. Jurgen Klinsmann has been sacked as USA coach, following two straight defeats in the final round of the 2018 World Cup qualifiers. Manchester City could be without Vincent Kompany for their Champions League clash with Borussia Monchengladbach on Wednesday. Serge Aurier will miss PSG's Champions League clash with Arsenal after British authorities banned the right-back from entering the country. Players in the Ghana Premier League will receive attractive remunerations following an initiative launched by Sports Cul Ghana Limited in Accra yesterday, which will inject huge amounts into clubs and players as well as sports development in general. Kumasi Asante Kotoko have beaten Wa All Stars 2-0 in the GHALCA G6 competition. It required a courageous man to tell Diego Costa that there was no reason whatsoever to indulge his dark side so often on the football field. The Black Queens of Ghana came from behind to beat Kenya 3-1 in their 2016 Women’s Africa Cup of Nations on Sunday in Cameroon. Black Stars goalkeeper Adam Kwarasey won his second silverware of the season after winning the Norwegian Cup title with Rosenberg BK on Sunday. The Black Princesses of Ghana have been kicked out of the FIFA U-20 Women's World Cup in Papau New Guinea after drawing 1-1 with USA in the last group game this morning. Kwesi Appiah to return as Black Stars coach? Former Ghana coach Kwesi Appiah ranks high among trainers the Ghana Football Association (GFA) is considering to replace current coach Avram Grant. Real Madrid extended their lead at the top of the La Liga on Saturday as a Cristiano Ronaldo hat-trick saw off city rivals Atletico Madrid at the Vincente Calderon. When Pep Guardiola needed a hero, it was Yaya Toure who showed up. The fairy tale of Toure's return became a happy ending for Manchester City and Guardiola. A 90th minute strike from Olivier Giroud has denied Manchester United a win over Arsenal in their Premier League clash at Old Trafford. A first ever continental title is the goal for Cameroon when the women's Africa Cup of Nations kicks off on Saturday but will the hosts flourish or collapse under the weight and pressure of expectation? Ghana’s, Lawrence Nyanyo Nmai will take on German’s Daniel Dorrer in a vacant World Mixed Martial Arts title, K-1 Thai Boxing. The Old Trafford will host the biggest game on the return of English Premier League this weekend as Manchester United faces Arsenal. Coach of the national female U-20 team, the Black Princesses, Mas’ Ud Dramani is optimistic that the team will qualify to the next stage of the competition despite recording just a point in two games. A shiny leather shoe cut through the air and water bottles scattered like nine-pins to all corners of the dressing room. Accra Hearts of Oak might bid farewell to the G6 tournament after they were held 1-1 by Medeama at the Baba Yara Sports Stadium.